Highlighting the importance of regular health check-ups, and creating awareness about the same, Saroj Super Specialty Hospital in association with Tata Power Delhi Distribution Limited (TPDDL) organized a free health check up camp in Inderpuri, New Delhi. Over 100 Local residents of all age brackets were present in the camp that included free medical consultations, cardiology screening, orthopedic consultation and physiotherapy and nutrition advice. 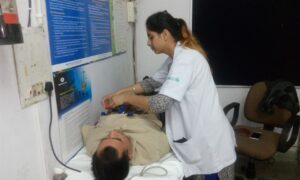 The assessment included ECG monitoring, blood sugar measurement, Blood pressure measurement, Body Mass Index (BMI), Eye check- up. In addition to it, Bone Mineral Density (BMD) was also checked for post menopausal women and men aged above 55 years. “Periodic health check-ups and screenings are keys to maximise your chance of living a longer and healthier life. As per the age bracket and health conditions, such checkups should be done frequently-monthly, quarterly and annually. Early diagnosis and screening plays a vital role for any individual in identifying the risk of potential problems which can be treated or prevented with some medication or modification in lifestyle. There is a paradigm shift in the pattern of diseases as well, earlier when communicable diseases were trending, has now subsided and more of lifestyle related ailments like hypertension, diabetes, and other associated co-morbidities have taken pace.” said spokesperson of Saroj hospital’s camp organizing committee. It has been told from years over and over again by medical professionals that one needs to have regular medical check-ups to keep track of their health and ensure that they are not having any unknown disease. Saroj Super Speciality Hospital, New Delhi has always been a front runner in providing a helping hand to any public initiative and community service. Patients were assessed, advised and counseled. Large number of people who were part of the camp included Middle aged individuals who were having basic health issues related to blood pressure, sugar, eye, etc. The residents were also educated about the importance of timely intervention and how important role it plays in maintaining a healthy living. Unlike earlier scenarios where water borne ailments were on the rise, are now being overtaken by lifestyle diseases.